Immediate Action Required - respectful but immediate path to petition the City of Pittsburgh and Allegheny County, to preserve an important artwork, located and painted on the top of the Tenth Street Bridge entering the South Side neighborhood of Pittsburgh. The Tenth Street Bridge is currently undergoing complete restoration and repainting. Unless immediate steps are taken to save this significant artwork, the piece will be repainted in a matter of days. The artwork, 10th Street Geese: has been in place for some 20 years, has been documented, and recorded as part of Pittsburgh's landscape. The painting is understood to be an important landmark, specific to Pittsburgh's image of revitalization. 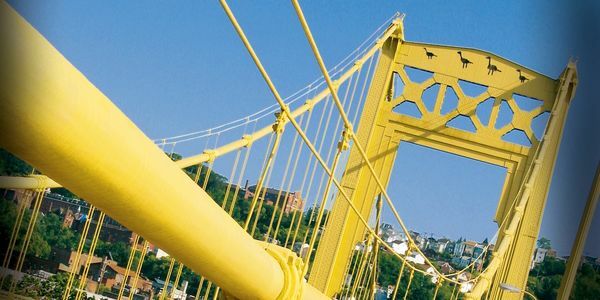 By preserving the artwork, and it's symbolic gesture of resilience and the spirit of the local arts community, the City of Pittsburgh will be once again be recognized for its commitment to public art and expression. Please see this effort to support and recognize the value in keeping the 10th Street Geese in place by not removing or repainting over the artwork. WE DID IT! WE SAVED THE 10th STREET GEESE! Because of your letters of support, the iconic 10th Street Geese will be replaced and remain part of our region’s dynamic public art collection. Your words have been heard, and are they ever great!!! The Geese paintings atop the 10th Street Bridge will inevitable be painted over, probably this week. However, there still remains the smallest sliver of possibility that Allegheny County will allow the Geese paintings to be restored and repainted! what an impressive call for action. I'm super impressed by the level of support to preserve the tenth street geese- as part of Pittsburgh's cityscape. Your collective voice will be included in my letter to the City and Allegheny County on Monday next week. And hopefully go a long way to keep this art on the bridge. If you see it in your heart to make a final push in adding signatures, please invite trusted colleagues to contribute to the effort.